Creating a national logistics network to support a client’s national accounts. Delivering a custom solution in over 130 countries and 200 worldwide locations. Providing a comprehensive solution for electrical, low voltage and technology installation. Delivering a next-generation network for up to 400,000 simultaneous users. Coordinating with other trades during store remodeling on a $2.5M project. 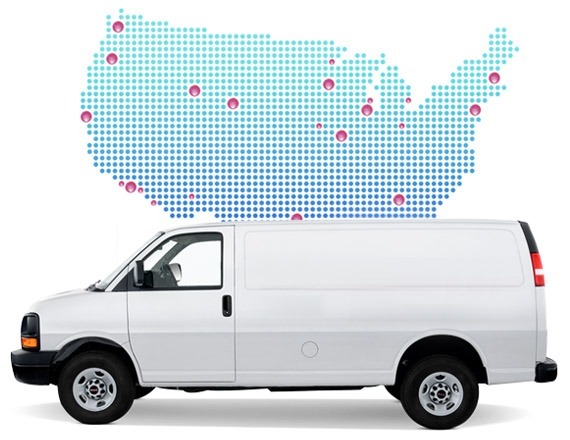 Delivering a single-source solution to 900 sites while achieving zero inventory shrinkage. A value added reseller of premised based VoIP solutions had a need to support a number of national accounts, including 24x7x365 on-site support for break/fix. This need included the requirement for critical spares and other significant components on-site in 4 hours or less. High Wire had a solution for the client that met all of their needs, had easy to understand all-inclusive pricing, and easy access via our Web based tools. For the client, High Wire’s 24x7x365 On Demand Service team handles all of their needs end to end. Whether they need a part moved out of a High Wire depot to the end user premise, or a technician to troubleshoot, the process is simple and easy to engage. High Wire’s team handles all of the heavy lifting upon the opening of a ticket. Our custom software manages inventory levels across all depots, provides alerts when replenishment is required based on customer defined thresholds, and allows for highly customizable reporting. Our On Demand Team is there to answer any questions, provide updates, and direct traffic. The end result is a highly reliable solution that delivers satisfied customers. 900 sites in under 5 months, with zero inventory shrinkage. High Wire Networks delivered a single source solution for over 900 nationwide fast casual dining sites. Each site required three trips, delivered in under 5 months from the end of beta test rounds. High Wire performed on the contract from our 55,000 sq. ft. warehouse in the Chicago Metro, where we inventoried, staged and shipped all kits. We provided same-day client survey and assessment deliverables, reducing time to installation by over one week. We met the client’s deadline by delivering over 200 sites a month, achieved zero inventory shrinkage across the entire project, and the scalable methodology and process developed by High Wire is being adopted by the client for additional projects. .
High Wire Networks delivered a “Built to Purpose” custom solution for a worldwide Non-Governmental Organization with offices in over 130 countries and nearly 200 locations worldwide. The High Wire Networks solution focused on the desired outcome of supporting the client’s extensive Cisco UC solution from the UCS servers to the handsets. The solution had to be more cost effective than a traditional break/fix solution with excessive availability fees, or fixed annual costs that will far exceed customer usage. High Wire’s solution was a pre-paid credit model that leveraged High Wire’s scale globally to normalize the currency and VAT differences into a single rate worldwide with escalators for expedited on site dispatches. The client purchases blocks of hours that they know they will utilize, and has 18 months before they expire. High Wire has delivered for this client at nearly every one of their sites in the past 24 months, including some extremely remote islands in the Indian Ocean.